By BERNIE BELLANIn the middle of singing his very funny - and touching song, "I was born to be a Yid", Len Udow looked at me videoing his performance, stopped and said: "Oh no, Bernie's going to put this on Youtube again." 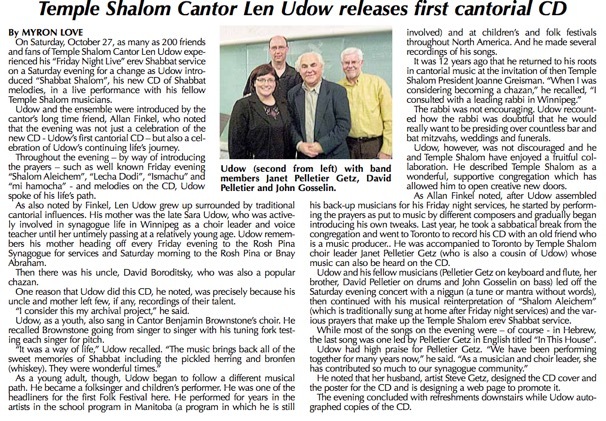 By BERNIE BELLAN On November 28 Len Udow, well-known songwriter, music producer, singer, and - for the past 15 years, cantor at Temple Shalom, will be releasing his most recent CD - and his second largely devoted to cantorial music. Hey there, time traveller! This article was published 12/4/2014 (726 days ago), so information in it may no longer be current. In 1958, the Kingston Trio's recording of the 19th-century folk ballad Tom Dooley topped the pop charts, selling more than six million copies and inaugurating a folk music boom. "Friday Night Live" Shabbat Services Published in the Jewish Post and News Wednesday, March 11, 2009by Fern Swedlove Friday Night Live at Temple Shalom Since its inception, Friday Night Live has become a special evening at Temple Shalom in Winnipeg for people in search of spiritual nourishment.